» Reviewed by Marvin Lachman: JOHN DICKSON CARR – Panic in Box C.
Reviewed by Marvin Lachman: JOHN DICKSON CARR – Panic in Box C.
JOHN DICKSON CARR – Panic in Box C. Harper & Row, US, hardcover, 1966; H. Hamilton, UK, hc, 1966. Paperback reprints include: Berkley X1587, 1968; Carroll & Graf, 1987. 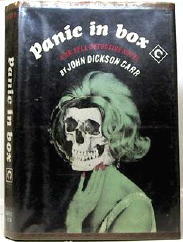 Atmosphere is always a strong element in any John Dickson Carr novel, and that is true of Panic in Box C, one of the last of his Gideon Fell series, recently reprinted by Carroll and Graf in paperback. By the time he wrote this book, Carr was long settled in the United States, the place of his birth, and increasingly he was finding reasons for Fell to travel and detect here. This time Fell is on a lecture tour, but he detours to attend a performance of Romeo and Juliet in Westchester County. Not only is there the obligatory murder and elements of impossible crime, but there is also effective use of the theatre, both its physical settings, and its lore, to add to an unusually good detective story. Fell remains one of my favorite detectives, a wonderfully eccentric Chestertonian type whose bluster artfully conceals his marvelous brain. His solution in Panic in Box C is one of the best and most witty in a long career of brilliant explanations by Carr. � From The MYSTERY FANcier, Vol. 9, No. 2, March/April 1987. Doug Greene in his bio of J D Carr makes an interesting connection between Panic in Box C and the earlier Carr book The Burning Court. Anyone who, by chance, reads Panic just after reading Burning might be very puzzled by a reference in Panic. Which puzzles me! Can you say more, without revealing endings or important plot twists? It’s almost impossible to avoid a spoiler but I’ll try—-From what I gather from Doug Greene’s book (I have read Burning but have not yet read Panic) a character from Burning Court is spoken of as being alive and well in Panic. As Panic was written many years after Burning, this character should not be alive if one of the explanations from Burning is to be accepted. Please email mail me privately if more info is needed. I don’t want to give the ending of Burning away for those who have not read it.